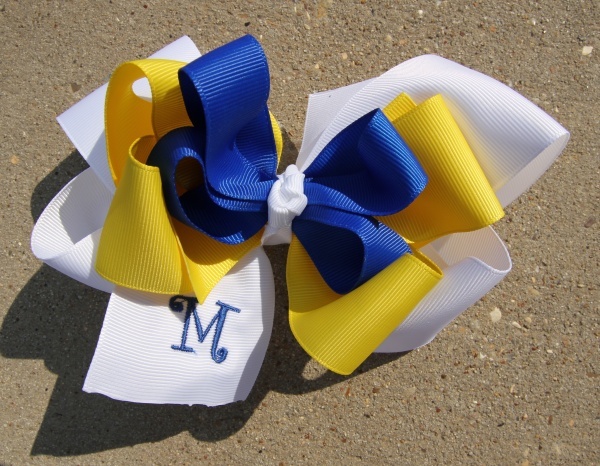 This bow was custom made for a school Spirit Day Bow. This has 3 colors which matched the girls T-shirt and school colors. This has 3 layers of solid grosgrain ribbon that are stacked upon each other and then tied into a French knot with a white ribbon. The white and yellow are both 1.5" and the blue is 7/8" wide. It can be done to match your school's colors and it will be done in the size ribbon as shown above. Just specify your 3 colors in the notes section. Pictured above, does have the added embroidery, so add this in the cart if you would like a 1" first initial in Mono Curls font on the front tail.